Network and make yourself a natural partner for a proposal. Apply successful partner search strategies and tactics. Establish trust and build a consortium. Follow the EU procedure precisely and exactly. Review and improve your proposal before submission. The Horizon 2020 book describes these steps beyond the technical requirements and focuses on the lesser known – but essential – social and procedural factors. 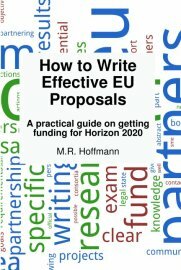 The book shows you how to optimize and streamline your networking and proposal processes to increase the chance of getting EU funding. partnership and writing proposals for Horizon 2020.
out bad proposals and join successful networks. Effective EU proposals for Horizon 2020 require learning. Read the book to help you get started in learning and evaluating other Horizon 2020 knowledge sources. Interested? The book is available through Amazon in the EU. Access effective training for EU proposals.